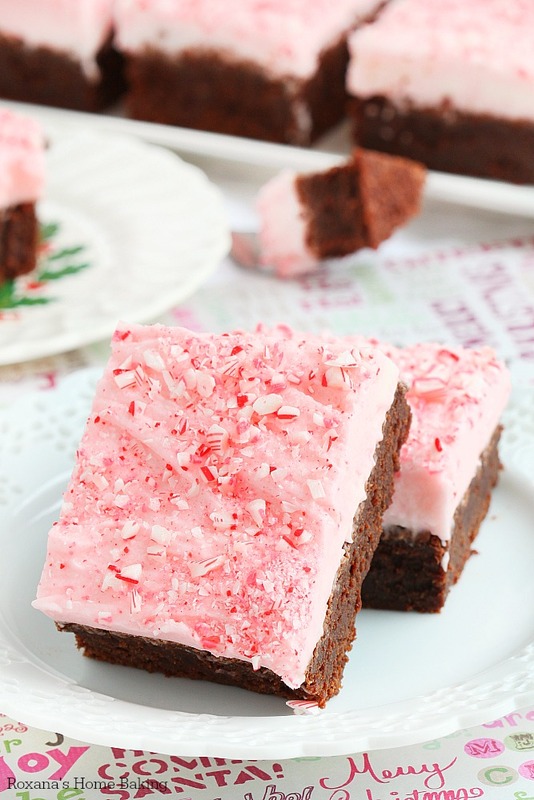 No one can resist these easy-to-make extra fudgy brownies topped with a generous amount of candy cane frosting. The perfect excuse to use those extra candy canes. There’s no surprise Christmas is my favorite time of the year. The smell of fresh tree, the hot cocoa, the lights, the presents but above all the candy cane! I love anything candy cane and already looking for excuses to get my hands on some more. Good thing they are cheap and widely available, right? From candy cane chocolate bars, to candy candy candles my house smells like a candy factory. My husband on the other hand, he’s not friends with candy cane. Or so I thought until he ate half of these brownies in one day. And I’m not blaming him! 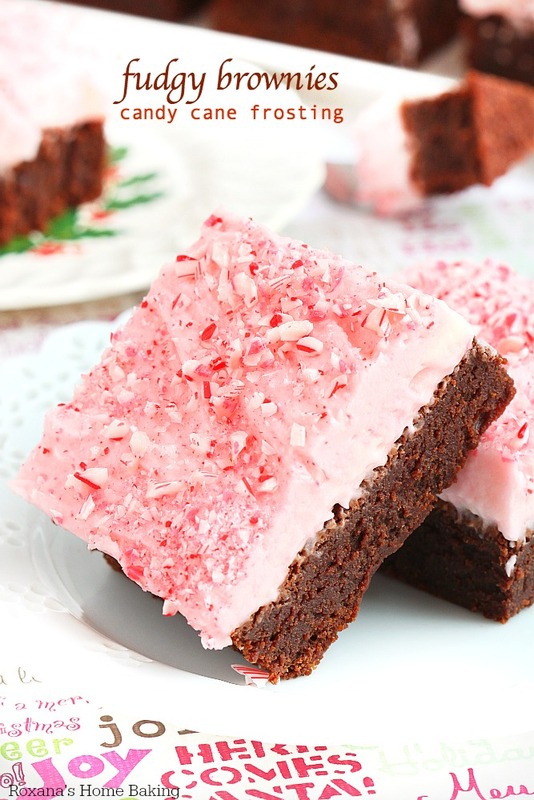 You see, these are not just some boring brownies with candy cane flavored frosting on top. No, these brownies are one of the best brownies I’ve made! They are so rich, so dense and so fudgy! To make them even more irresistible, I finished them with a generous amount of peppermint buttercream and crushed candy cane! Cut them is small pieces and have a glass of milk close by, you’ll need it! The process of making these irresistible fudgy brownies starts with melted chocolate. 6 ounces of chocolate goodness for a pan of brownies. But that’s not all, these brownies have unsweetened cocoa powder added to the batter as well. Double chocolate richness! You see why no one could resist them? They are uber-decadent! As I said, start my melting semi-sweet chocolate with butter until smooth. 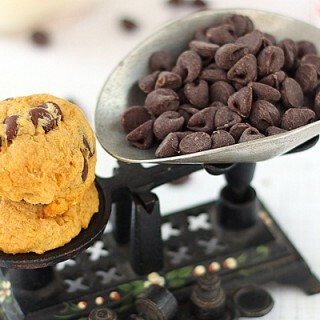 Place it in a mixing bowl and beat for few minutes until warm to the touch. Add the sugar, followed by the eggs, flour and cocoa powder. Once all the ingredients are mixed in, the batter is very rich and fudgy. The sign of an incredible delicious brownie! Bake the brownies for 40 minutes, not a minute longer! If you bake the brownies longer, they will turn out dry and no one wants dry and crumbly brownies, right? 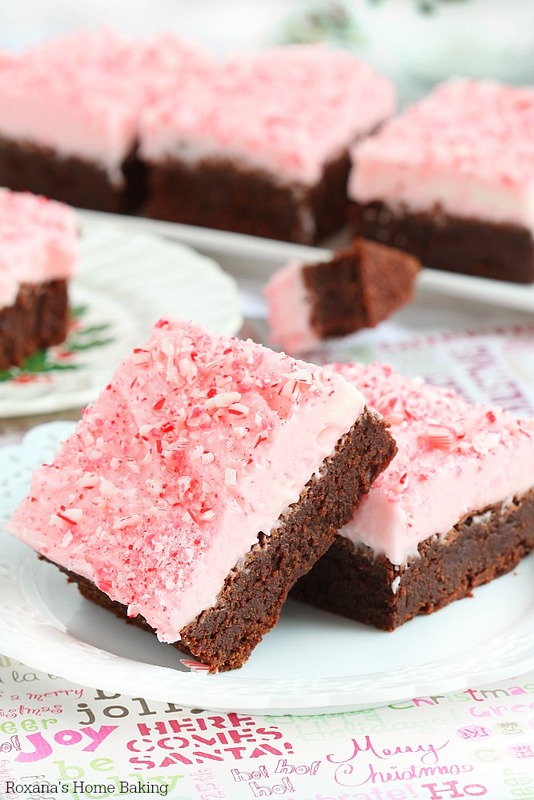 To finish the brownies, you need to make the candy cane frosting, for which you’ll need room temperature butter, powder sugar, International delight peppermint coffee creamer and a few drops of red food color. 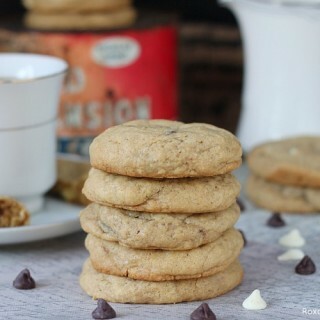 Since the frosting uses peppermint coffee creamer there’s no need to add peppermint extract. If you want to take the brownies to the next level, add crushed candy cane both to the frosting and as finishing touches. Line a 11X7" baking pan with parchment paper (do not skip this step or you won't be able to remove the brownies from the pan). In a medium saucepan melt the butter and chocolate. When melted, pour it into the mixing bowl and, with the paddle attachment on, beat on medium speed for 3 minutes. Add the sugar and mix for 3 more minutes. By now the mixture should be warm to the touch. Add the eggs, one at a time, and mix until combined. The mixture should have a rich creamy texture once all the eggs are mixed in. Add the vanilla extract and slowly stir in the flour and cocoa powder. Pour the brownie batter into the prepared pan and bake for 40 minutes. Do not overbake! Remove the pan from the oven and leave to cool completely on a wire rack before frosting the brownies. In a mixing bowl add the butter. With the paddle attachment one, beat on low speed until light and fluffy. 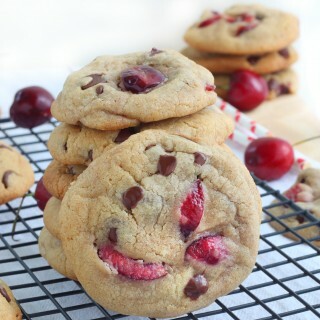 Add the peppermint creamer, 1 cup of powder sugar and beat for 3 minutes until well combined. Slowly add the remaining powder sugar, 1/2 cup at a time, scraping the sides of the bowl after each addition. Add 1-2 drops (depending on how red/pink you like) of red food coloring to the frosting and spread in evenly over the cooled brownies. Sprinkle some crushed candy cane on top. I love how thick that frosting is!! OMG! I am normally not a huge fan of peppermint but for some reason that goes away during the month of December. Anything with candy canes is so festive. These brownies hit the mark. These pictures are beautiful! And that frosting -- so thick and creamy! My husband would go nuts for these! They look so good!